This online textbook/course is designed to incorporate various topics from the overall site, ChemWiki. The ChemWiki is “designed to maintain all Modules (pages of chemistry information) in the primary sections” for the core classes in Chemistry. There is also a link to Wikitexts, which contains classes put together by faculty who select which modules to include. As with any wiki, the materials are continually being updated, but in reviewed by peers. 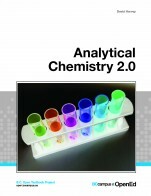 "Analytical chemistry spans nearly all areas of chemistry but involves the development of tools and methods to measure physical properties of substances and apply those techniques to the identification of their presence (qualitative analysis) and quantitation of the amount present (quantitative analysis) of species in a wide variety of settings." You just viewed Analytical Chemistry. Please take a moment to rate this material. If you know the author of Analytical Chemistry, please help us out by filling out the form below and clicking Send.